The clock is ticking. We have one more goal to achieve----- the removal and defrocking of Apuron as Archbishop of Agana !! Next month will be a year since we started picketing in front of the Agana Cathedral. Yes, march on. Intel says that the Neos have started flying out to Rome! 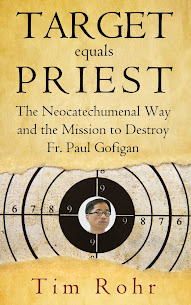 Runing to papa does not change the facts of the atrocities inflicted by Apuron and his NCW masters upon the Guam Church. As always, they think their numbers will influencs the outcome of what the truth has revealed. Intel says that they are meeting with Kiko. Last batch of "fruit bats" are flying out between the 12th and the 17th. This must be their last hope to save Bro. Tony. Once again Webster called it. March on......Webster said: march on they did! In yesterday's readings at Mass, Peter addressed those who had crucified Jesus. Peter, with his preaching, cut to the heart of his listeners (Acts: 2). In response, the sinners asked, "What must we do, brothers?" EVEN THOSE SINNERS who had cut short the earthly life of the Messiah, and were in turn cut to the heart by Peter's words, could utter the word "BROTHERS." When will all Catholics on Guam be cut to the heart so as to do the same? Maybe when people like you stop thinking that you have a license to lecture everyone who don't measure up to your standards. Don't you have anything else to do? Timothy Guile, If I wanted your comment or opinion to what I wrote, I would have asked you. Yesterday was Good Shepherd Sunday, and for Apuron it's "I am the shepherded, I don't know my flock (except for my community and when I want chenchule') and my flock don't know me ( I'm untouchable)." If they took the time to read Walter Denton's testimony? How Walter began his mission to speak out about his sexual abuse. 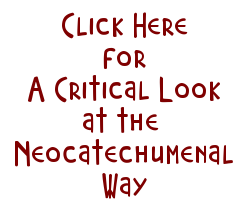 Though a "Neocatechumenal Way - An Insider's View" had this to say. Innocent people do not run and hide and try to change their appearance. Thanks, Guam, you are admirable! A hug from Spain! Mr. Klitzkie, congratulations. I saw in the PDN a couple days ago that the Dept. of Land Management and Director Mike Borja are in the process of paying a huge fine for not complying with the FOIA request. Is Mike Borja a NCW? Is that why he tried to "work something out" instead following the judges original legal advice?